The Puritan Hard Drive (PHD) is the single largest one-time digital publishing event of Puritan, Reformation, Reformed Baptist, Reformed and Biblical Presbyterian and Covenanter resources ever produced. Combine all of this with the very useful PHD software and there are many reasons to rejoice for such an unprecedented Puritan and Reformed Bible study tool. As a Reformed Baptist pastor, it is also interesting to note, that the Puritan Hard Drive contains 2,208 Reformed Baptist books, MP3s and videos. Spurgeon, Bunyan, Pink, Fuller, Gill, Griswold, Pollard, Bennett, along with many others can be found here. The PHD also contains a very large number of for Reformed Presbyterian resources (books, MP3s, videos) and Reformed commentaries, including a number of very rare and valuable commentaries and commentary sets that most people are not likely to have access to outside the PHD. All of these resources are easy to access by just clicking on the "Select Category from List" button on the main search screen. Additionally, the affordable price for both the downloadable and USB Puritan Hard Drive versions (Windows and Mac), makes this a must have Reformed resource for all of God's people. Moreover, Still Water Revival Books' (SWRB, who are the creators of this program) also allows every family member in the same house to legally use the Puritan Hard Drive on all their devices. Thus, whole families can be blessed together, growing in holiness by drinking deeply from the wells of truth set forth by the best Christian teachers throughout history. Imagine having access to over 12,500 Puritan and Reformed resources right at your fingertips. Imagine being able to instantly search out what the Puritans have said concerning various Bible topics with the click of a button. Imagine the time you would save studying the Bible, preparing sermons and Bible studies, doing writing projects. Imagine the depth of knowledge and insight one would gain from those great giants in the faith who have gone before us. The Puritan Hard Drive offers all this, and much more. For example, though there are many ways to slice and dice the information, the Puritan Hard Drive contains (using the easy-to-use and powerful proprietary software) a Master Full Text Search feature which is particularly useful. Using this search you can quickly locate every word, phrase, or Bible verse (or verses), across all the searchable text on the PHD. This kind of research power has never before been available to Christians, especially as it pertains to such a large group of the best Puritan and Reformed resources from throughout history right up to our day, including many rare Puritan and Reformed classics that are unavailable elsewhere or that would cost large sums of money to obtain. With the click of a button, a massive number of search results come to you alphabetically by title (with the author included) so you can quickly scan down the list of titles and authors to find what you want. When you want to explore deeper into a book you simply click the icon to the left of the title and you will see all your search terms, with each search term in the context of one line in that book. This helps you to quickly determine if the results in a given book provide the exact information you are seeking. This feature also allows you to cover a vast amount of material in a short amount time. When you find precisely what you are looking for, just click on that particular line and you are instantly taken to the right book, already opened to the right page, and your search result is highlighted so you can see it on the page immediately. Depending on what you are searching for, results can come in the hundreds to hundreds of thousands. In fact, you can accomplish thousands of hours of research in moments with the Puritan Hard Drive. This not only gets you to the precise truth you are seeking, but it also does it faster than ever before possible. What's more, most of this kind of research would be humanly impossible outside the Puritan Hard Drive, as the PHD can dig deeper and faster than thousands of people, and can complete these searches in a small amount of time. For instance, as noted on Still Waters Revival Books' Web page, a search for the word "prayer" brings up 97,170 search results in 1,378 documents. Being able to search so quickly and accurately, through many of the best Christian resources from throughout history, allows for the most extensive and deepest research ever available on any topic you want. Also, the Manual for the Master Full Text Search feature on the PHD, which is entitled "How to Find Specific Words and Phrases in Searchable Books.pdf", contains a number of screen shots that are easy-to-follow and it will help you use this wonderful feature to its full potential. When you see what the Master Full Text Search feature does, I think you will be very pleased that such great research capabilities have been placed in your hands. Of course, the Master Full Text Search is just scratching the surface concerning what the Puritan Hard Drive can do. You can even add your own notes to every resource and the Puritan Hard Drive will save them for you, then you can use a special search to find specific notes you made or you can search for your own notes mixing and matching many other search criteria. Also, many search features can be mixed and matched to produce whatever level of detail you want. From the beginner, to the power user, the PHD provides you with broad or exact results and everything in between, as you have total control over the complete research process with pinpoint accuracy. Furthermore, included is a very helpful PDF manual that can walk you through each feature. This manual is filled with clearly written instructions and screenshots showing you exactly where to move your mouse to make the best use of all the features on the PHD. Even better than that, SWRB provides tutorial videos at PuritanDownloads.com that show and tell you exactly how to get the most out of your Puritan Hard Drive. For these tutorial videos just click on the link "ALL PURITAN HARD DRIVE VIDEOS" (without the quotation marks) in the left column at PuritanDownloads.com. The first two videos on this page are overviews of the Puritan Hard Drive and all the videos that follow are tutorial videos. All these videos are YouTube videos so it is easy to pause and rewind each video as you learn. You can even run the videos with the Puritan Hard Drive opened, listen to a point where the video shows you how to do something, pause the video, do the action stated on the PHD, and repeat, until, you master all the features at your command. The PHD was designed to allow you to mix and match the capabilities of many of the study tools it contains, to obtain the best research results possible, and following these videos is the best (and fastest) way to make optimal use of the PHD. Concerning the creating of the PHD, Dr. Reg Barrow (the president of SWRB) mentioned to me that he saw the Lord answer many prayers, over the 26 years it took to produce the product. Knowing that the Lord so closely watched over all aspects of the development of this product has given the brothers at SWRB an earnest desire to share the treasures of our Lord's truth found on the PHD. 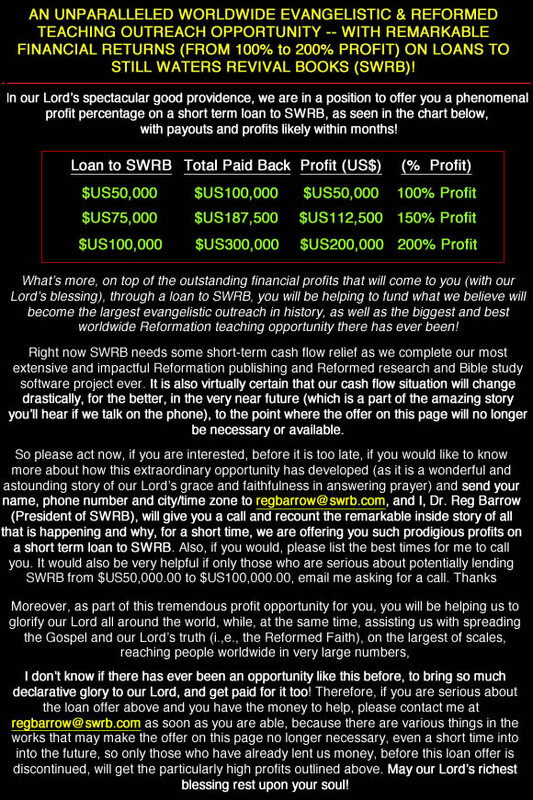 This is why SWRB has implemented a monthly payment plan for those who cannot afford the PHD in one payment. Just contact them, using the contact information at PuritanDownloads.com and let them know your situation and they will do their best to help you obtain this resource at a price you can afford. A host of others have also endorsed the Puritan Hard Drive. Among them are Paul Washer, Dr. Joel Beeke, Dr. Voddie Baucham, Richard Bennett, Paul Barnes, Greg Price, Dr. Matthew McMahon, Jim Dodson, Dr. Steven Dilday, Brian Schwertley, and John Hendryx (Monergism.com). If you would like to see more reviews about the Puritan Hard Drive, including reviews by everyone mentioned above, just click on the link "Puritan Hard Drive Reviews" (without the quotation marks) near the top of the left column at PuritanDownloads.com. In sum, the Puritan Hard Drive is an amazing resource; I wish I had known about it sooner. I strongly commend it to you for your own spiritual growth and as a blessing for your entire family. To me, it is one of the best Christian study tools available on the market today. Jason Spanogle: My name is Jason Spanogle of Ligonier Ministries. We're here with Steve Lawson for a conference, and Rob, Pastor Rob Ventura had mentioned the Puritan Hard Drive. Tell us a little more about that, Rob. Rob Ventura: Yeah, thanks Jason. So, again we are here at the One Passion Ministry with Dr. Steve Lawson in connection with Jason and the brethren at Ligonier Ministry. And I did mention to the men that they could get a discount at this particular conference for the PHD or Puritan Hard Drive. I received a copy of it a few weeks ago. I've been using it. And it's really outstanding, I think, for pastors and preachers, even just a lay person in the pew, if you want to know what the Puritans said about various topics. Absolutely outstanding. So, highly recommended. Really a great tool. I'm thankful for Still Waters Revival Books, that organization, putting it together. So thanks for asking, brother.